I remember where I was sitting, what I was doing, when the diagnosis was given to me. "What?" "That isn't me! I am NOT going into a life sentence of MS while everyone around me lives in color and 3-D!" It seemed that my life would disappear, that my name, my hopes, my dreams, would lose their shape and become this disease. Life sends curve balls. Even though we may not have thought that our life was particularly well planned or orderly, these events are so wild, so demanding, so overwhelming, that it is as though we used to live on a quiet lake and now we exist in a tsunami. Have you ever had that experience? It doesn't have to be Multiple Sclerosis, but that was the name of the tsunami that visited my life. I fought that diagnosis as long as possible, and when it kept coming back I finally entertained the possibility that my life was over and now I would become some person with MS. I wondered: how do others meet this storm and come out on the other side with their spirit and identity still intact? Wonderful funny stubborn beautiful strong and remarkably regular people are living their lives in color and in 3D. Some of them have MS, others are living through the impact of MS on someone close to them. Like all of us they find their strength in different ways. Some through religion, some through equanimity, humor, family, digging deep and finding a new way to approach their life. All of them are living life beyond this particular event called MS--how do they do it, what has shifted in their lives, how do they judge the good life today, what is more important today, these and other questions get answered through the stories of amazing people who got told that their life, already full, now would also include MS.
Liz-- "Now I see life in terms of what I want to do and what I can do! Mandy--"My advice for anyone with MS is this: If you find a passion, and you are truly passionate about it, go for it, because it will keep you going. Beyond MS--Your Best Life is now available in print and ebook. 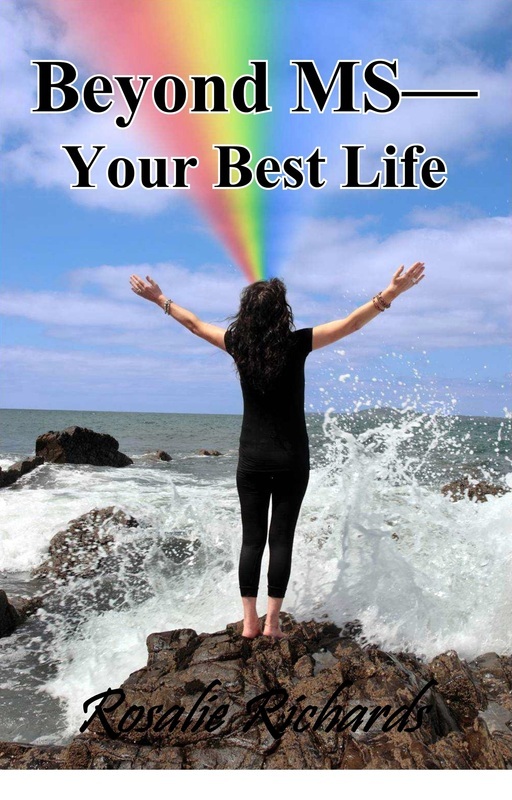 To buy on Amazon ($9.00 plus s/h) and other stores, search for the title Beyond MS Your Best Life. To order from this website, go to the Contact Rosalie page or click on the Paypal button below.. Through this website, the book is available for $9, shipping is free in the continental USA. E-books are available through Amazon.com. The Beyond MS series is beginning now. As always, your thoughts and questions are welcome and will become a part of this journey that we all share! Most importantly, if you know someone (or a family member) with MS, I would love to be in contact with them, because the stories we share make a difference.